There’s no doubting that the tech world is abuzz about Windows 8, Microsofts upcoming iOS and Mac OS X competitor. If your curiosity is peaked by all the talk, you can easily install Windows 8 and have it running on top of Mac OS X thanks to virtualization. The best part about this particular solution? It’s all free, so read on. Note: Don’t want to use VMWare? 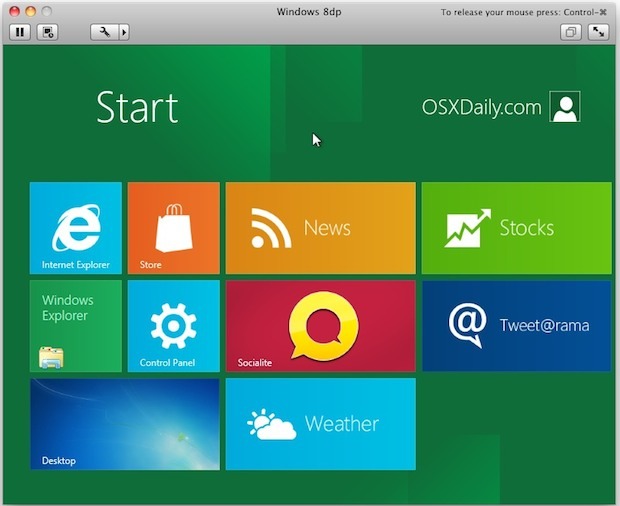 Here’s how to install Windows 8 in VirtualBox, which will run in Windows, Linux, and Mac OS X. The Windows 8 iso is about 4GB GB but transfer very quickly from Microsofts servers, and getting the VMWare Fusion trial is just a matter of confirming your email address. Assuming you have now downloaded the Windows 8 Developer Preview ISO file and then installed VMWare 4, you’ll probably want to quit most of your other apps so that you can free up as much RAM and CPU as possible. This has been confirmed to work in both Mac OS X 10.6 Snow Leopard and Mac OS X 10.7 Lion. From my brief usage, it seems like Windows 8 would be best with a touchscreen, and I wasn’t too thrilled with using a mouse in the Metro interface, but nonetheless it’s worth checking out yourself if you’re curious about this stuff or just like keeping on top of the latest tech trends. Enjoy! BTW, VMWare Fusion 4 costs $49, but if you have no interest in buying it the 30 day trial works just fine to check out and play with Windows 8 to see what the hype is all about. That was quick, great work guys. Okay, I have followed all the instructions, but when I go to select windows 7 double prime in the os selection, it does not appear there. What is wrong? 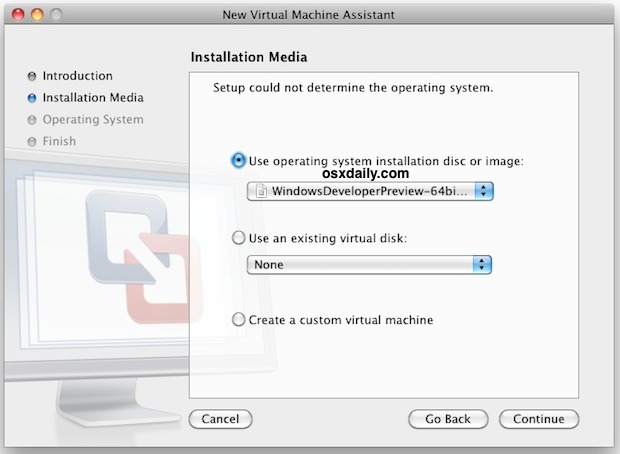 Update: Just tried it again, and it tells me that vmwhare fusion can not determine the operating system. Hrm. I still have Fusion 3.1.3, and using the 64-bit version of Windows 8 on Lion won’t work. I’m downloading the 32-bit one now to try, though, but it doesn’t come with the developer tools (only 64-bit does). Windows Developer Preview 64bit installed with no issue on Lion OS X with Parallels 7, free for 15 days, using MBP 13 mid 2010. However, after 1h of usage I decided to use a dedicated PC as the virtual graphics card was a bit too slow (did not bother too much figuring out if Parallels supplied a specific driver for the video card). If any body knows how to skip this part of the install so I can play with Windows 8 on my MacBook Air I would appreciate it. I tried installing Windows 8 on my MacBook Air, late 2011 model, via bootcamp assistant and got a weird split screen glitch. I could only see the top half of the installer, and the bottom half was the top half duplicated. I don’t know if I’m making much sense. Am I the only one who experienced this? I have exactly the same problem – same 2011 MBA, via bootcamp = split screen glitch. I installed it in Parallels 6 on Lion. No problem! Easy squeezy! Just keep hitting OK. I believe you need VMWare 4 or latest parallels for it to work. I tried an older VMWare and it errors on install. I downloaded and used Virtual Box. It worked fine. Hmm, no go for me. I get the dreaded “vcpu-0:NOT_IMPLEMENTED vmcore/vmm/intr/apic.c:1903” that I got on a windows 7 box running VMware workstation 7. I had to upgrade it to vmware workstation 8 to get windows 8 preview to install. On fusion I have the same issue but I don’t see an update for it yet. Oh well, no big deal …. So far windows 8 seems the same like windows 7 except for the launchpad style “metro” screen with WP7 icons on it… too many colors for my taste. I disabled it through a registry entry so now its just like windows 7 with a square start button. Hi, when I install Win8 in VM or Parallels, everything works to the moment I try to install Parallel or VM tools, from then I get a permanent black screen and nothing else. I installed the Tools on mine but I did upgrade to Fusion V4. Are you perchance running V3? I get the same issues. I can load it on Fusion 4.x and it runs fine but will not do full screen. As soon as I install VMware tools and reboot, I get the black screen after loging in. Update: On the Mac, virtual box worked! Windows 8 preview is installing on it fine. It’s a free download from oracle so no prob. 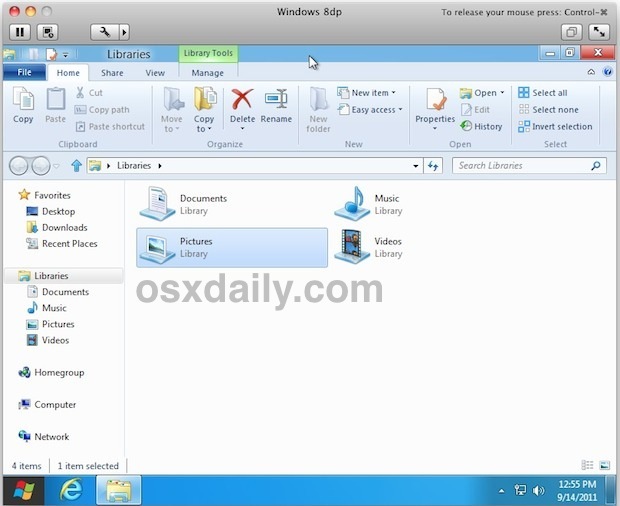 How do you remove Windows 8 and VMWare on Mac? Just installed everything, had a wee play around with it and stuff. Not much use. It’s rather crap without touchscreen. So yeah, any ideas of how to remove all of this so I can get my what, 20 gigs or something of data storage. Just delete the VMWare image you created when you set it up, the default location should be in your user home directory unless you specified otherwise. I installed it no prob with parallel 7, but can’t open any of the applications, in metro mode. When I try this it wants an activation code before Windows will install. Anyone else? Anyone have such a code? Windows 8 requires drivers to install on VMware Fusion and Win8 media does not provide those.